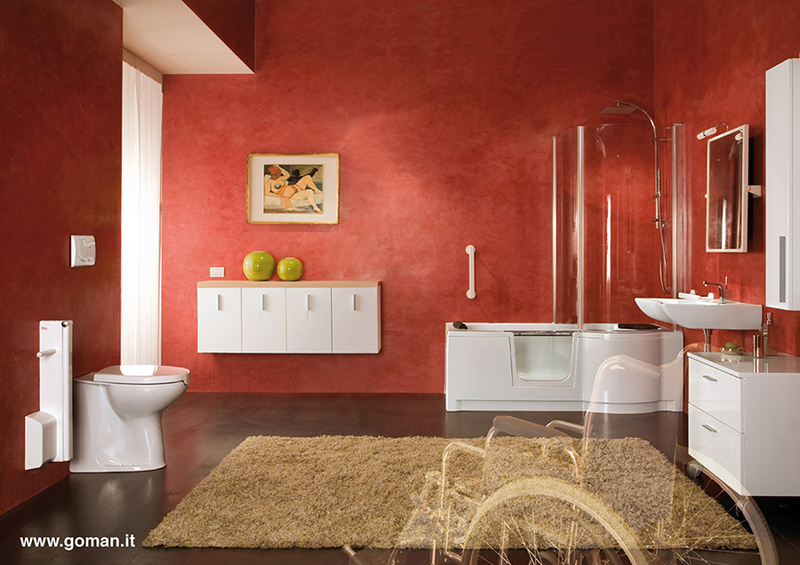 In respecting all legislations, and attentive to the dignity of the persons, the bathroom sanitary articles and the aids for disabled are designed and produced to be use by every body (disables or not) in complete and safety autonomy. For example, the lavatory bowls have been developed to allow a free movement of the wheelchair and for an easy standing up or sitting down. For this reason, the lavatory bowls are higher than usual and there are models that have a front opening to facilitate personal hygiene using a shower’s douchette. 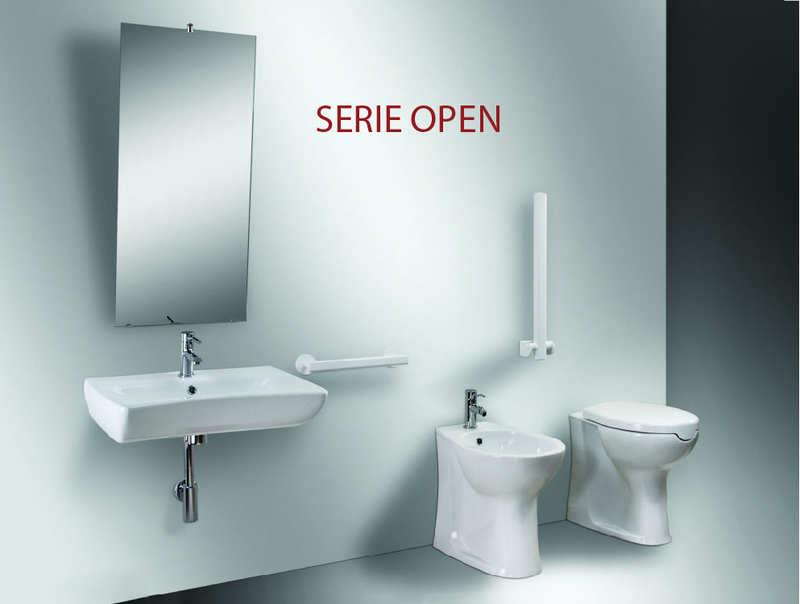 The hand basins are suspended, ergonomic, with concave front for an easier access and they can be supplied, for reclining, with manual or pneumatic mechanisms. 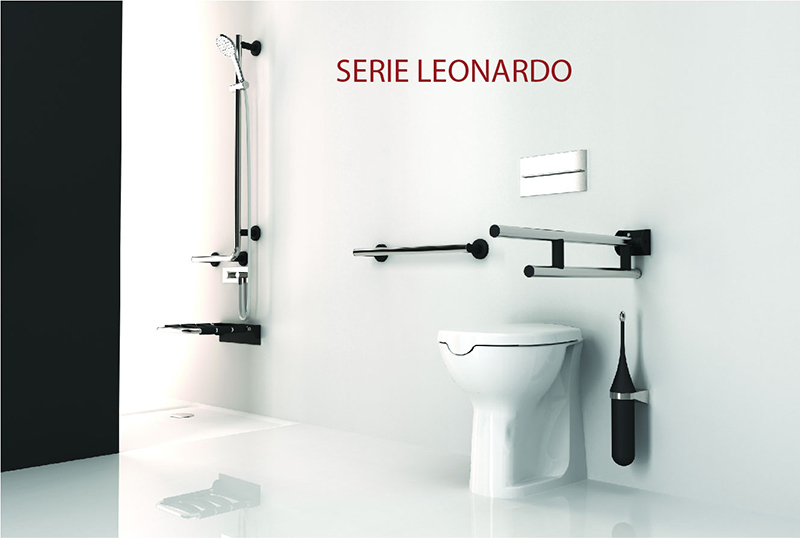 The taps and fittings, included in the catalogue, are equipped with medical, electrical or self-timer levers. 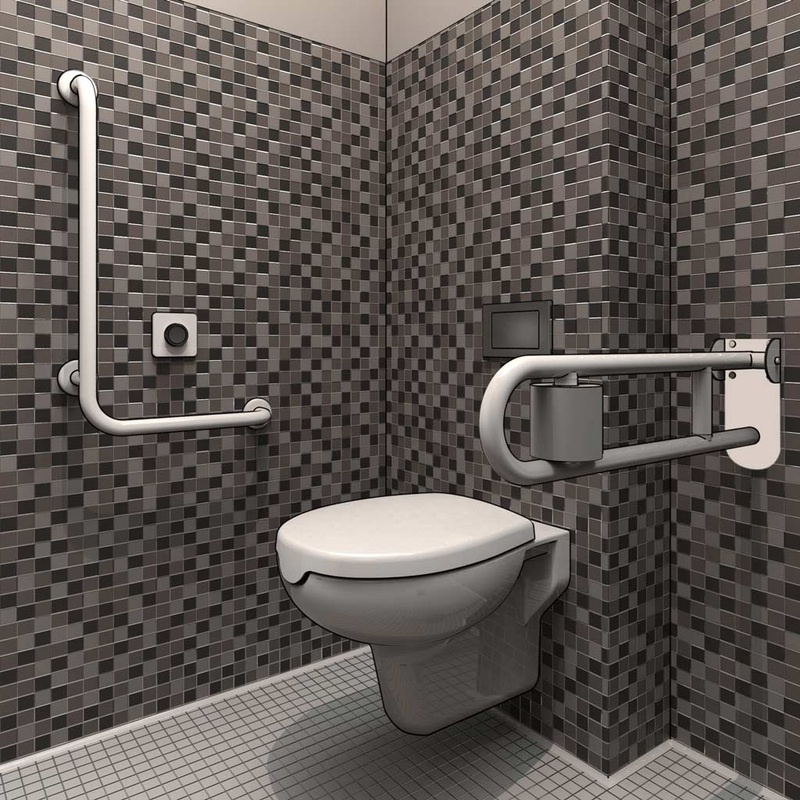 Next to each bathroom fixture, it is suggested to install a suitable handrail or grab bar to allow movements and use also for those who have reduced or impaired motor capacity. 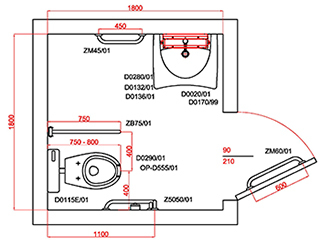 Wash basin area: the wash basin must be of a shelf type shape and it must be placed at 80 cm from the floor level, with an underneath open space of at least 70/75 cm. The space for access must be 80cm, the taps must be “lever type”. The mirror must be usable for all, including children or person seated in a wheelchair, therefore tilting. WC area: The lavatory bowls must have the seat at a height of 45/50cm from the floor, or, preferably, suspended. The length must be75/80 cm from the wall, to allow for access to a wheelchair. The distance from the side wall must be of min 40cm. to allow the manoeuvre. 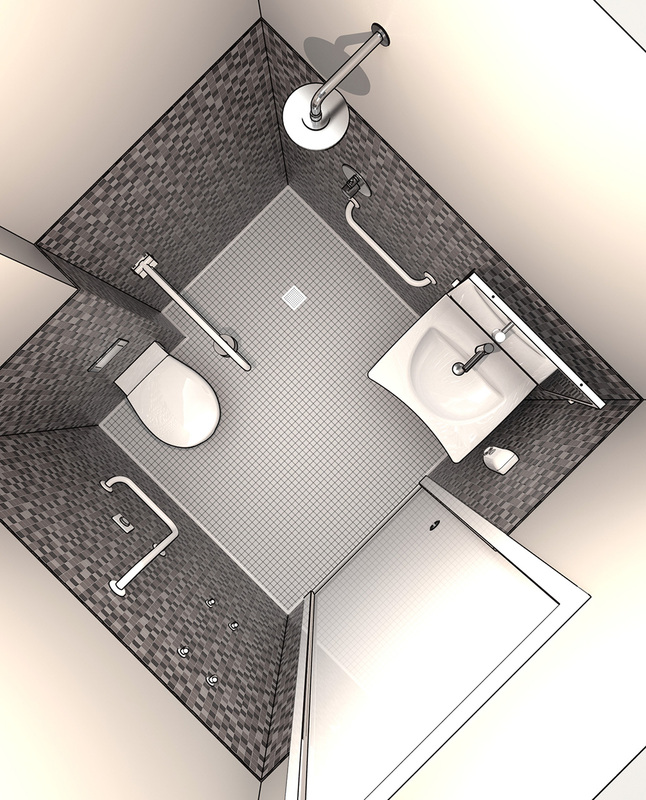 On the other side it must have an open space of at least 100 cm from the centre of the toilet seat. There should be horizontal grab bars on one side and ideally a folding down bar on the other side, at a distance of 80cm. The flush button and a toilet roll holder should be placed in a convenient, easy to reach position. A bell is obligatory. 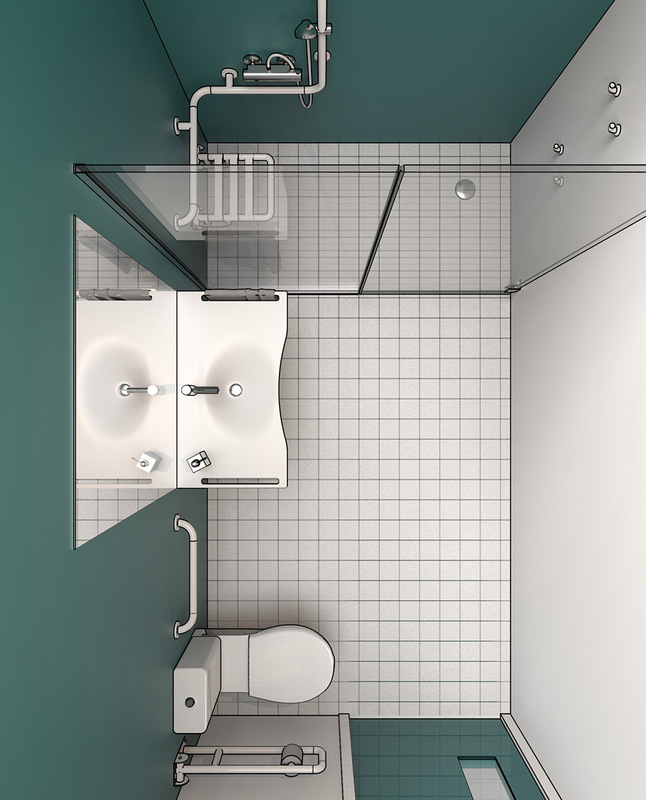 Shower area: In the case there is a shower, the shower tray must be at floor level; it is as well recommended to provide the shower with a folding seat , placed 50cm from the floor, and suitable grab bars, at a height of 80cm.